Today, we enter the netted world of artist Toshiko Horiuchi MacAdam. It was her work that inspired me to do this series Knits & Nets. I first encountered her art at the Hakone Open-Air Museum in Japan. At that time, I did not know her name since I was busy watching my son rather than looking for a sign indicating the creator of the masterpiece. It wasn’t until a few weeks ago that my friend Ani shared an image of the same netted playground, which she discovered on Pinterest, that the identity of this creative genius was revealed to me. The Idea: crocheting sections of a play structure installation and piecing them together on-site. What Toshiko has done using crocheting techniques just blows my mind. When you crochet and make a sweater for someone, that’s very sweet and thoughtful. However, when you create a massive web of crocheted sections to create a venue for countless children to explore, jump on, frolic, imagine and just enjoy the pure bliss of childhood —then to me you are a hero! For adults, Toshiko’s netted play structures are a sight to behold. To children – a play experience in and around it is an experience to cherish and talk about for the rest of their lives. In a way, it creates in the young minds a blueprint for simple joys: a little color, a little play, a little laughter, and make a friend or two! Toshiko MacAdam (born Toshiko Horiuchi) is a Japanese textile artist based in Bridgetown, Nova Scotia, Canada. 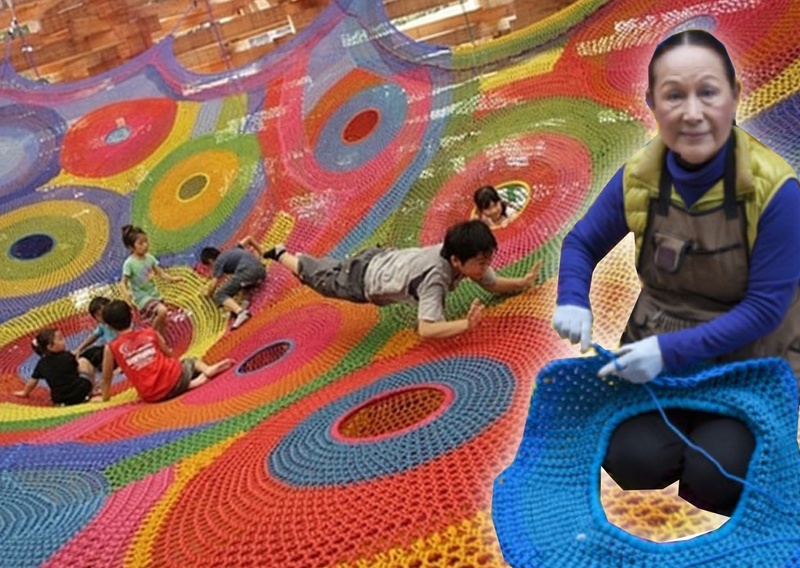 She is best known for her work with large-scale textile structures, especially “textile playgrounds” for children, brightly-colored net-like structures of crocheted and knotted nylon. What inspired Toshiko to make these netted play structures? “She was inspired to create textile playground spaces for children after seeing children climbing in a three-dimensional textile sculpture that she was exhibiting. After this discovery, she began to observe the lack of parks and playground in Tokyo, where she was living at that time, and the negative effect that was having on children. In 1971, she created her first work intended for children, which was later donated to a Tokyo kindergarten designed by Hatsue Yamada. She exhibited her next piece at the National Museum of Modern Art in Kyoto. 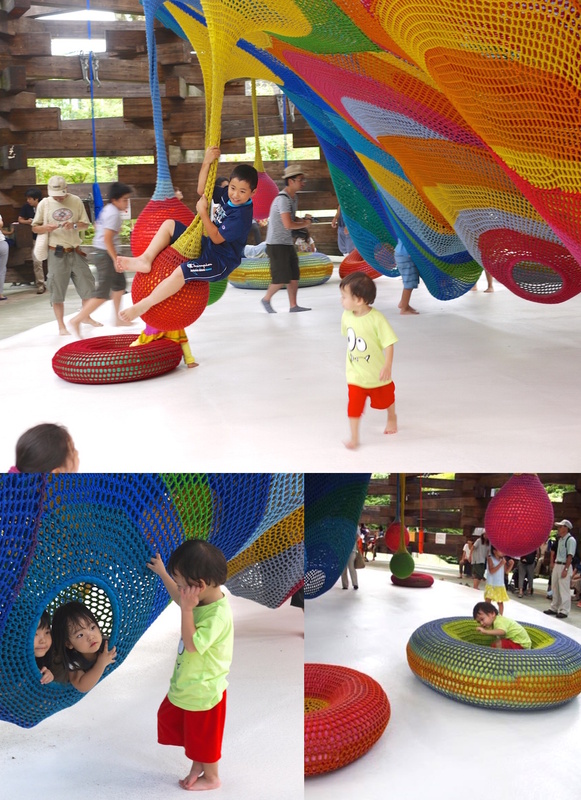 Here are some photos of my son enjoying Toshiko’s FUNtabulous netted playground at the Hakone Open-Air Museum in Japan. My son Lucas, in the green shirt was following his friend Ryuto around (boy in navy blue, son of my dear friend – Japanese violinist Mizue Hoshi). As you can see, Lucas managed to make a friend or two as Toshiko’s art not only invites one to play but also interact with other little folks. *The visuals and the music in this video when the first person enters Toshiko’s play structure make me very sentimental – maybe on the subconscious level it brings fetal memories: the warm, cozy days in the womb – no worries, no hurries – just time to wonder, imagine, and grow! And if they had a fantastic time, then that gives me great pleasure. So do…ponder on the inspiration behind Tohiko’s net playgrounds —seeing children climbing in a three-dimensional textile sculpture that she was exhibiting and after which -observing the lack of parks and playground in Tokyo, where she was living at that time – she started to create work intended for children…Thus, observe what happens around you today as the universe may just be about to reveal to you your true calling. This entry was posted on March 16, 2015 by Paulina Constancia in Create, Explore and tagged Arts & Crafts, Creative Professionals, kid friendly, playgrounds.